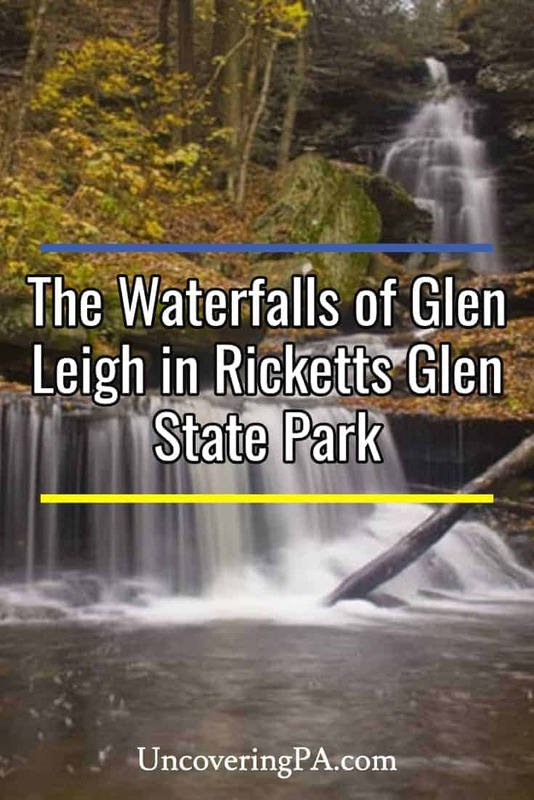 There’s no doubt that Glen Leigh in Ricketts Glen State Park is one of the most beautiful sections of water in the entire state. 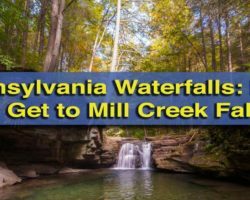 In the 0.7 miles from Waters Meet to the top of the last waterfall, hikers pass eight amazing falls, giving this area of the park the highest concentration of waterfalls. Hiking here is a bit different than other places in the park. While Ganoga Glen and the waterfalls below Waters Meet have you walking directly beside them, staying on one side of the water, the ruggedness of Glen Leigh requires several bridges to cross the streams, a couple of short walks through the woods, and even a stone staircase that’s carved right into the rock. This makes the hike along Glen Leigh a bit more interesting than hiking the other parts of the Falls Trail. A wooden bridge crosses Kitchen Creek just below R.B. Ricketts Falls. Because of this recommendation, the waterfalls in Glen Leigh are listed from bottom to top, with the first waterfall listed being closest to Waters Meet. Should you be hiking down Glen Leigh, simply reverse the order of the waterfalls. Wyandot Falls is the closest waterfall in Glen Leigh to Waters Meet. 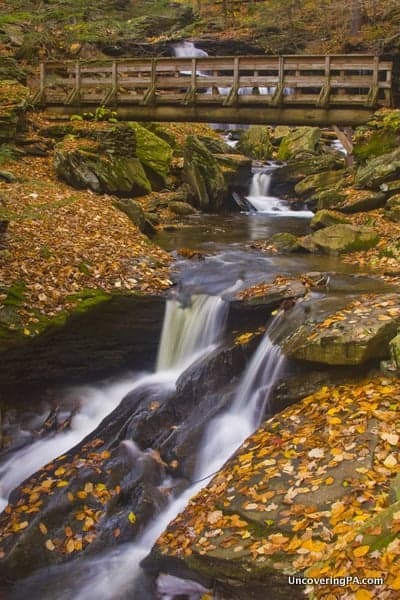 Wyandot Falls is the first waterfall you’ll come to when hiking up Glen Leigh. Less than a tenth of a mile up the trail, this is one of two waterfalls visible from Waters Meet (the other is Erie Falls in Ganoga Glen). 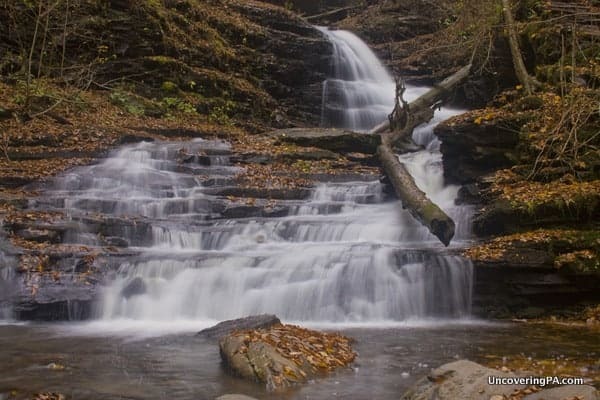 Wyandot Falls is only 15 feet tall, making it one of the smallest waterfalls in the glen. However, given that the water here falls in a single drop, it’s still a very impressive waterfall. Wyandot Falls was named for the Wyandot Tribe that once inhabited Ontario. Also known as the Huron, they were largest wiped out by disease and war with the Iroquois in the mid-17th century. B. Reynolds Falls in Glen Leigh. B. Reynolds Falls is the second waterfall along Glen Leigh. At 40 feet tall, B. Reynolds is one of the most impressive waterfalls in the glen when water levels are high, but can be a bit underwhelming when water levels are low. Right before the waterfall, the trail crosses a wooden bridge over Kitchen Creek giving you a variety of great vantage points to see this waterfall from. B. Reynolds Falls is named after Benjamin Reynolds. Reynolds was the brother of R.B. Ricketts’ wife and was a banker in Wilkes-Barre around the turn of the century. R.B. Ricketts Falls was named by Ricketts himself. The third waterfall in Glen Leigh is R.B. Ricketts Falls. This 36 foot tall waterfall is the one that Ricketts chose to name after himself. And, while a beautiful waterfall, I can’t figure out any reason why Ricketts would have picked this particular waterfall to be his namesake. R. B. Ricketts was a colonel during the Civil War and fought at Gettysburg. 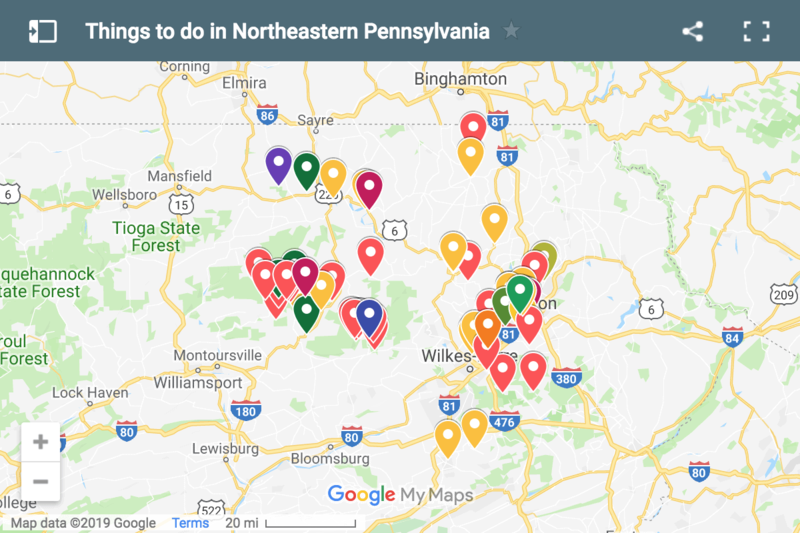 After the war, he bought 80,000 acres in northeastern Pennsylvania, some of which he protected from logging and eventually became Ricketts Glen State Park. 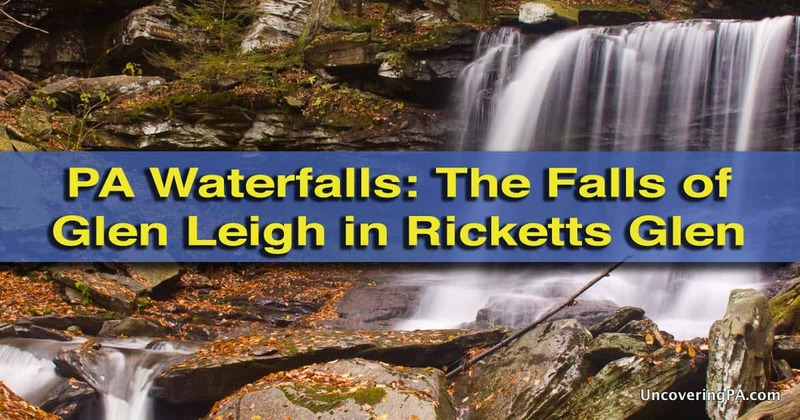 Ricketts is also responsible for both naming all the waterfalls and paying to have the Falls Trail built in the late 19th century. 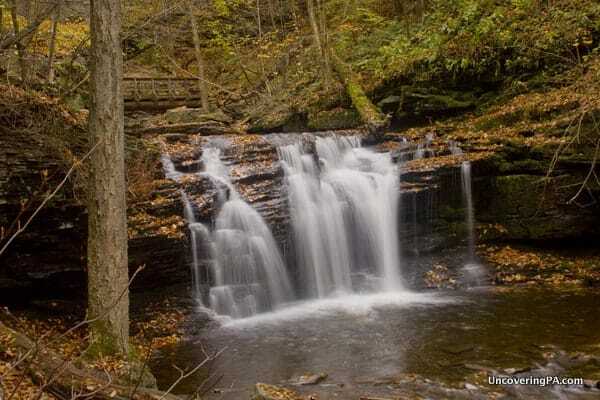 Ozone Falls is the second tallest waterfall in Ricketts Glen but is hard to get close to. The fourth waterfall in Glen Leigh is Ozone Falls. At 60 feet tall, this is the tallest waterfall in Glen Leigh and the second tallest in the whole park. Despite being much shorter than Ganoga Falls, I actually think Ozone falls is much more beautiful. 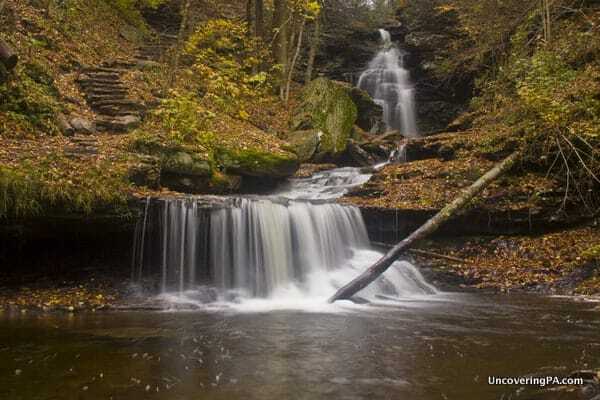 Given the names of the other waterfalls in Ricketts Glen State Park, Ozone Falls stands out as quite odd. After all, it’s the only waterfall in the park not named after an Indian tribe or a person. 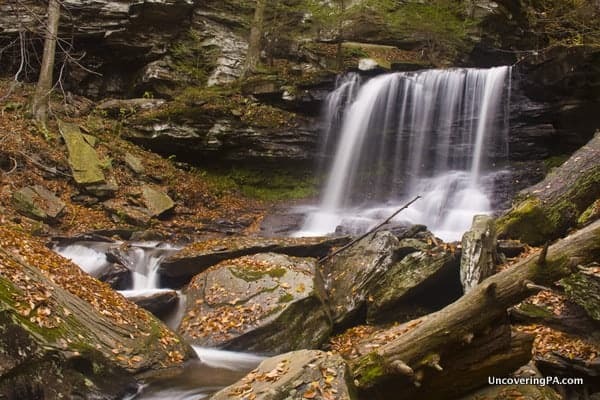 Instead, Ozone Falls is named after a local hiking club that was based in Wilkes-Barre and often visited the area. After Ozone Falls, the trail heads up into a series of switchbacks and leaves the creek briefly, before returning and crossing a wooden bridge just above the waterfall. Huron Falls makes a very unique turn while cascading down Glen Leigh. The 41 foot tall Huron Falls is the fifth waterfall in Glen Leigh. Despite being the second tallest waterfall in the glen, it’s not as impressive as some because it falls in two drops instead of one. This waterfall is also unique in that it makes a nearly 90-degree turn after the first drop, giving it a very unique appearance. Huron Falls is actually named after the alternate name for the Wyandot tribe of Ontario. I find it a bit odd that Ricketts named two waterfalls after the same tribe, but who am I to judge. Huron Falls has a very cool stone staircase that takes you right along the edge of the waterfall. Use extreme caution on these stairs as they can get very slippery and there is no railing next to them. I’d say this is one of the more dangerous parts of the entire trail. 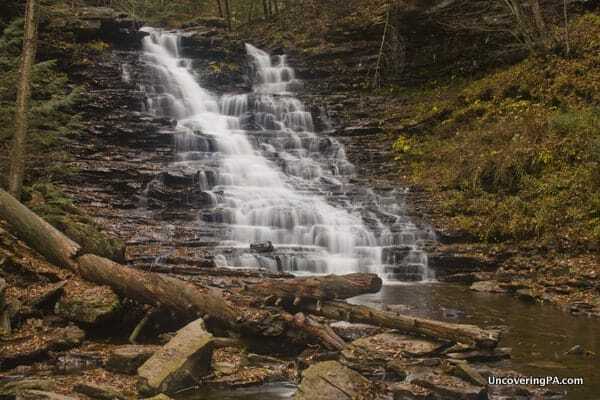 Shawnee Falls is one of the more interesting and photogenic waterfalls in Glen Leigh. 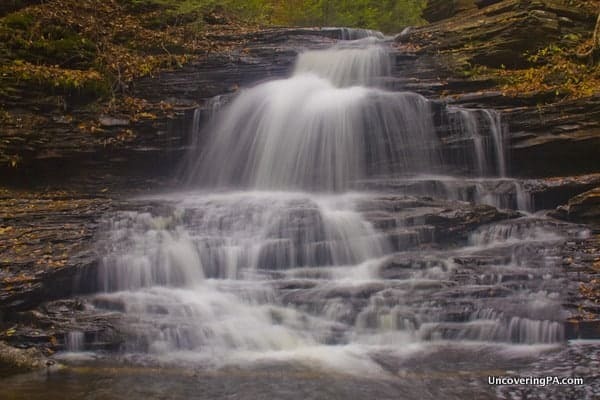 Shawnee Falls is located so close to Huron Falls that you could almost consider them one waterfall. In fact, there’s a good chance that they were one. 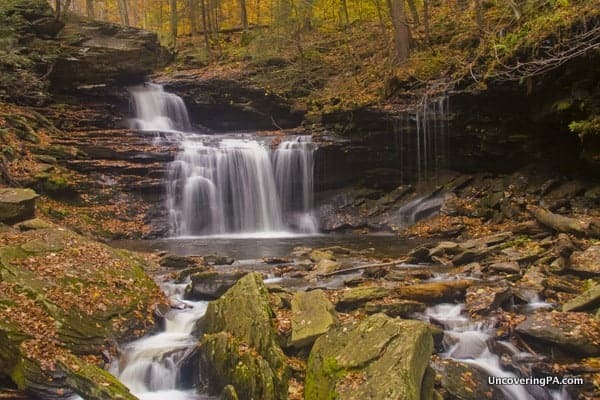 However, since there is a small plunge pool below Shawnee Falls, it is considered a separate waterfall from Huron Falls. Shawnee Falls is 30 feet tall and has two separate falls with a very cool “hump” in the rocks that it hits on the way down. 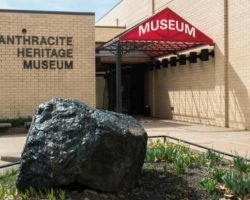 The waterfall was named for the Shawnee Tribe. These semi-nomadic, Algonquin speaking Indians came to Pennsylvania in the late 17th century, but left by the end of the 18th century. F.L. Ricketts Falls cascades down the glen. F.L. Ricketts Falls is the 7th waterfall in Glen Leigh. At 38 feet tall, it’s also one of the tallest, but since the water slides instead of falling, it makes this waterfall a bit more unique. Frank L. Ricketts was the younger brother of R.B. Ricketts. F.L. managed his brother’s nearby lodge for many years. The trail next to this waterfall used to be on the left side of the falls, but was moved to the right side in 2003. Just above this waterfall is a shortcut to the Highland Trail, which takes you back towards Ganoga Glen and the Lake Rose parking area. However, taking this shortcut saves very little time and bypasses the last waterfall in Glen Leigh. Onondaga Falls is the uppermost waterfall in Glen Leigh. Onondaga Falls is the uppermost waterfall in Glen Leigh. At only 15 feet tall, it’s one of the shortest waterfalls in the glen, but is still quite beautiful. The trail in this area had to be reconstructed in the early 2000s after it was washed out in a flood. 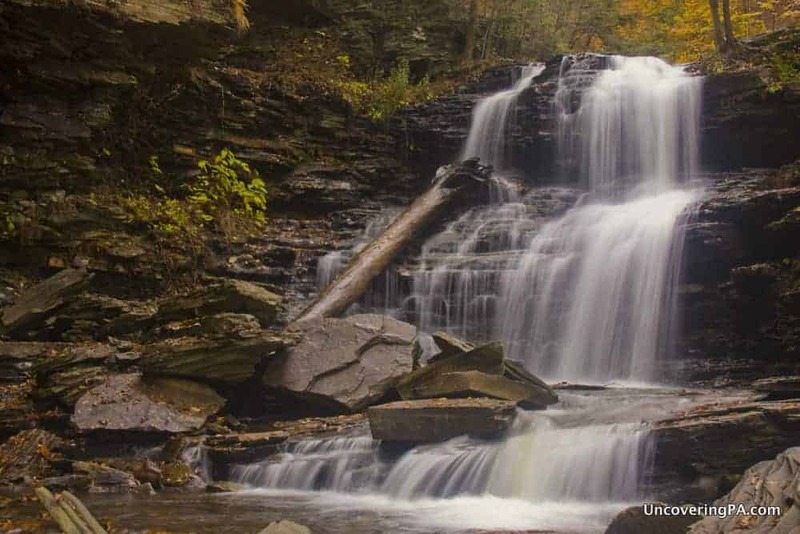 Onondaga Falls is named for the Onondaga Tribe who lived in central New York. As the most central tribes of the Iroquois Confederacy, tribal councils were held on their land and the area now known as Onondaga, New York was considered the Iroquois capital. 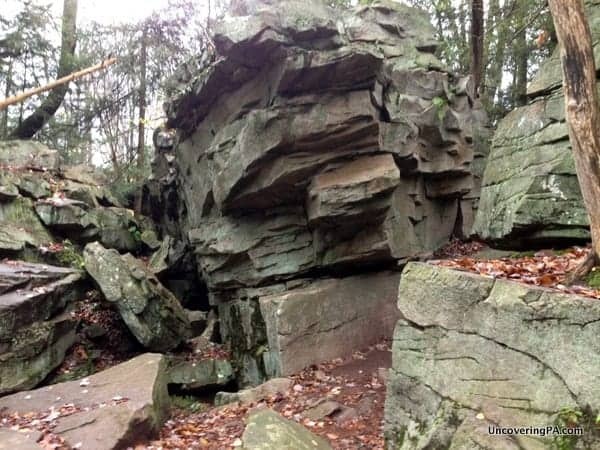 From Onondaga Falls, you’ll almost certainly want to follow the signs for the Highland Trail, a 1.2 mile trail that takes you west towards Ganoga Glen. If you continue straight at Onondaga Falls, you’ll follow the trail one mile past the old dam at the now dry Lake Leigh and eventually to Beach Lot #2. This can be a good parking choice is the Lake Rose Parking Area is full. Assuming you take the Highland Trail, you’ll walk through a beautiful forested area of the park. About halfway between the two glens you’ll come to an area known as the Midway Crevasse. This is a rock outcropping that the trail passes through. Eventually, you’ll get to a split in the trail. Head left to go down the trail towards Ganoga Glen. 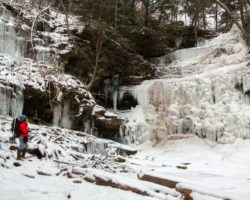 If you parked at the Lake Rose Parking Area, as I recommended in my first article on Ricketts Glen, head right for the short hike back to your car.